The Frontiers of the Roman Empire is a serial site that comprises parts of the Limes Romanus, a border defense or delimiting system of Ancient Rome. The two sections of the Upper German-Raetian Limes in Germany cover a length of 550 km from the north-west of the country to the Danube in the south-east. 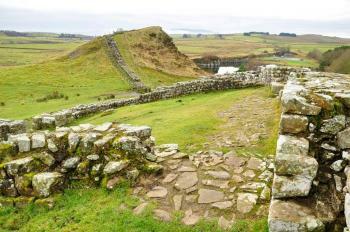 The Hadrian's Wall was built under the orders of the Roman Emperor Hadrian in AD 122. It took soldiers six years to build a wall 80 Roman miles long (117km) on the border of what is now England and Scotland. 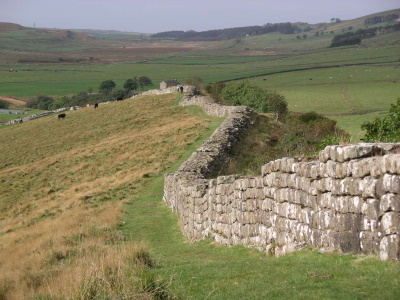 Emperor Hadrian built this wall "to separate Romans from Barbarians": it formed the most northern border of his empire. Later, there was some Roman expansion further north, resulting in the Antonine Wall. I toured the eastern part of Hadrian's Wall by bus from Newcastle, in the appropriately named AD122. This public bus stops at all things worth seeing along the way, so you can hop off and catch a later bus after you've visited the site. A good service I think. 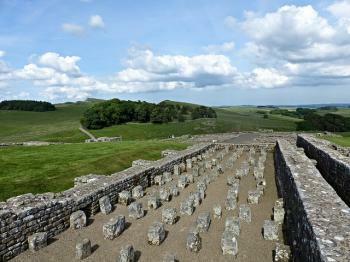 My first stop was at Housesteads, the remains of a fort just at the wall. Because it was built on a hill, there are fine views over the countryside here. Vindolanda is a bigger complex, somewhat inland from the wall. 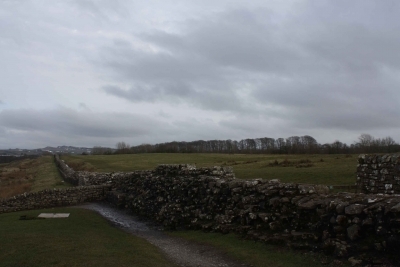 This Roman site is actually older than Hadrian's wall itself. Archeological excavations are still under way here, and some reconstruction has been done so it is easier to imagine how it has looked like in ancient times. It's also the finding place of the historically quite spectacular Roman writing tablets, that tell about daily life in this area in Roman times. March 2018 - After our stay at the Lake District we continued our Journey to Newcastle. We looked for the nicest route which was always along the Hadranwall. Most parts however were not very spectecular, but some other parts whereas were quite interesting. We made a few foto stops, but at the end the whole drive to Newcastle was very fast. The German Limes we haven't really visited yet. Of all the WHS on the list, I’ve been to Hadrian’s Wall the most. Growing up, it was the closest, and as such, I’ve visited most of the best preserved sections: Birdoswald, Walltown, Halsteads, Vindolanda, Chesters. How best to officially ‘mark off’ such a familiar site? We chose to walk a 10 mile section of the wall, from the Walltown Quarry section all the way to Halsteads fort, on a blustery but clear December afternoon, which really added to the atmosphere. This section represents the wall at its best preserved and most dramatic, and truly gives an impression of what the Roman soldiers posted along the wall must have felt, being on the fringes of the empire. The walk along the top of the ridge was very pleasant, though can be a little taxing in places. Halsteads is personally my favourite of the surviving fort remains, though if you’re not a member of English Heritage, it will cost you to get in. I would wholeheartedly recommend it. The AD 122 bus is very helpful for getting about, and let us get back to our parked car with little issue. Earlier that year, we also visited the Antonine Wall in Scotland. Stretching from the Clyde to the Forth, the Antonine Wall is the northerly sibling to the more famous Hadrian’s Wall. Occupied for far less time, the Romans constructed a more temporary structure, and as such, much of it was constructed out of dirt rather than stone. Compounding the problem, the central belt of Scotland is far more populated than Cumbria and Northumberland, and thus any stonework that did exist was mostly repurposed into building material. The two best preserved sections, Bar Hill and Rough Castle, are easily visited by car from either Glasgow or Edinburgh. They were perhaps a little more difficult to appreciate as remains, but none the less they both made for a very pleasant and enjoyable day trip. In August 2006 I visited the Roman fort of Saalburg, a part of Upper German-Raetian, and at that time I wrote a review that the German section of this World Heritage Site was not well known compared to its counterpart in England because the German Roman frontiers were hard to see as it was almost entirely built by wood and right now most of them are just many small traces on the grassland or the few stones in the forest. It was really hard for normal people to appreciate this site. The only place you can get some imagination of Roman fortress is Saalburg, just north of Frankfurt, which has a fully reconstructed fort and good museum. Saalburg Fort has been mentioned in ICOMOS document as the only new reconstruction part of German-Raetian that ICOMOS accepted as a WHS, so it tells you something about the quality of this place. At that time, the best way to see Saalburg was to take a train to to Saalburg via Bad Homburg and followed the hiking route to "Romerkasteel Saalburg" for about 2 km. I remembered that I walked through lovely forest and saw some traces of the Raetian which was quite fascinating to see some ruins left in the German forest, after a good long walk in nature it was quite shocking to discover that Saalburg fort is just next to a very busy German Highway. A decade later in December 2016, I have visited the most famous part of this UNESCO site, the Hadrian’s Wall in Northern England and the lesser known Antoine Wall in Scotland, it was a totally different experience with the German one. 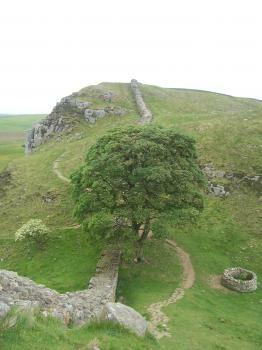 Hadrian’s Wall was located on the beautiful grassland hills with the long line of stone wall that seem to be endless. Something that really remarkable to see and easy to appreciate. I drove from New Castle to Carlisle and saw many well preserved sections of this great heritage site. I did many brief stop to hike along the wall and to admire the breathtaking surrounding of Northumberland and Cambrian landscapes. One of my favorite parts is the Cawfields section near the town of Haltwhistle. Not only has the Hadrian’s Wall reached one of the highest hills, the view of long line of stone wall was almost similar to the Great Wall of China, the nearby Cawfields Quarry where the Roman cut the stone to make the wall were also interesting to see. While the Hadrian’s Wall offered a remarkable experience, the Antoine Wall brought me back the memory of the German part. The Scottish section actually was quite similar to the sites in Germany. There was almost nothing to see except some earth mounds. I would rather say the German part is actually maybe better at least there were some stone foundation left, but for Scotland, there was really nothing. Fortunately I combined my trip with the Falkirk Wheel and the contemporary giant art of the Kelpies which made my trip more enjoyable. I believe that this World Heritage Site is going to expand to include other Roman Frontier especially in Eastern Europe and the one in Netherlands. While I have no objection to add more sites as their historical values are quite obvious, the question of are there anything left to see is my main concern. I really enjoyed Hadrian’s Wall because it is something that really exist, something I can see, touch even climb on it, and actually one of the best World Heritage Site of England. But in Germany and Scotland, sometime I need to use a lot of imagination to appreciate the empty sites. I hope this great site in the future will not become the collections of obscure pits or holes or anything that archaeologists and historians can link to the Roman. I visited the Hadrian's wall in June 2016. I'm glad I had visited Germany's Limes first as my expectations were low and moreover I could appreciate the OUV of this transnational site. I was lucky to visit on the only day without rain for days on end, so much so that I spent a whole day here instead of a couple of hours before heading to Durham. As I drove westwards from Newcastle I made a couple of stops along the road to Carlisle. Most of the car parks are not free, however the pay and display ticket is valid for all the car parks. I visited the remains at Carrowburgh: Temple of Mithras and walked quite a stretch along the hadrian's wall path there to see the parts where the wall is still covered by grass and soil and a great grazing spot for sheep. After a long walk, I went back to the car park and drove to the Roman auxiliary fort of Vindolanda. 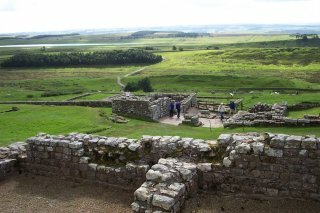 Although this is the largest set of ruins and also the oldest (it predates Hadrian's wall! ), I felt it was geared too much at attracting childrens' attention and at times it felt like a school outing hotspot. Next I drove a couple of kilometres past Housesteads Roman Fort and parked next to a visible part of Hadrian's wall with very big stones, a few metres from the main road. 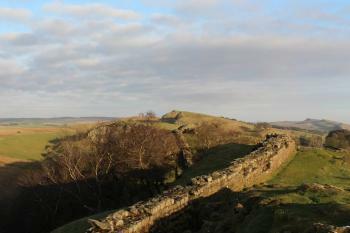 This helped me appreciate the seemingly neverending length of the wall across the rolling hills of Northumberland. 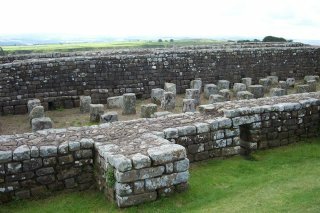 The sight of the remains of Housesteads was a welcome change and it surely must have been an imposing fort as there are lovely views from there. I think that visiting Housesteads Roman Fort is a must to get a very good overview of several elements of this inscription. There's a very small museum next to the fort with some remains and also the UNESCO plaque in shocking pink. I also visited the Roman sites in Corbridge before heading towards Durham. All in all, I really enjoyed my visit and look forward to visit the Antonine wall in the near future. The Antonine Wall in Scotland, constructed almost 1900 years ago, was the northernmost Roman barrier in Europe, and became the newest extension to the Frontiers of the Roman Empire World Heritage Site in 2008. I visited one section of the wall at Rough Castle Fort on a sunny afternoon in September 2015. Rough Castle is very close to the Falkirk Wheel, so I parked by the wheel and continued on the path above the canal to the site of the fort on the Antonine Wall. Unfortunately, because the wall was turf-covered and the wood structures are no longer extant, not much is left to see. 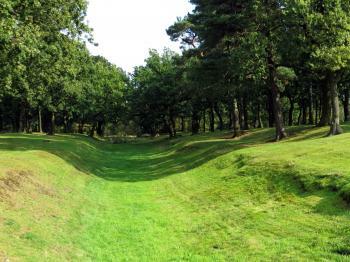 The most striking feature is a defensive ditch with a turf-covered rampart. Beyond the rampart are foundations for former structures, such as a barracks and a bath house, and most have helpful placards to provide context. 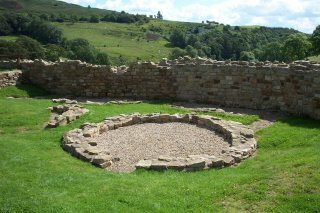 I found the section of the Antonine Wall at Rough Castle Fort to be peaceful and interesting to explore, and I look forward to some day seeing other components of this World Heritage Site in England and Germany. Logistics: The Antonine Wall stretches across Scotland between the Firths of Forth and Clyde, and is accessible by car and foot; the sensational Falkirk Wheel made a good base for parking and hiking to Rough Castle Fort. There are lots of ways to see this WHS - in two countries. I have been to the UK's Hadrian's Wall site, but for the German bit, I focused on Saalburg Roman Fortress near Bad Homburg. It is the only Roman fortress in the world to be rebuilt and is imposing on a hill with large external walls guarding the buildings inside. If a reconstructed Roman fort is not your thing but you’re in the area near Saalburg, another option is to go exploring yourself. In the forests nearby are relatively untouched Roman ruins and visitors are free to hike along the trails and discover things for themselves. In fact, it’s the same along much of the original boundary wall that stretches across the Germany. Although there are official sites that have been protected or restored, there’s still a lot which is just out in the open. Because the original route of The Limes covers so much of the country, it’s easy to come across a part of it on your travels and see what there is to visit in the area. I visited Hadrian's Wall in October 2015 whilst in the area for a family reunion. We walked a circular route of about 10km, starting in the Northumbrian hamlet of 'Once Brewed', walking along the wall and taking in two of the ruined Roman forts - Housesteads and Vindolanda (although without paying to enter them). There is quite a view of the lakes below from the ridgeline between Once Brewed and Housesteads, so I can recommend it as a section worth visiting. Having said that, there was little to see but fog when we went. Hopefully somebody can visit and review the Antonine Wall for us, since nobody seems to have covered this recent addition yet. 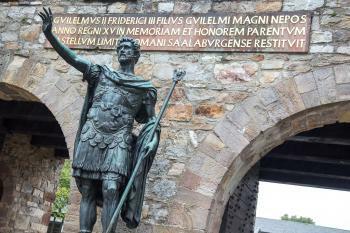 I visited the German Limes and Roman Fort of Saalburg in Bad Homburg in October 2013. The Limes are the only original stone remains still in place today in Germany. The rest was mainly made of wood and therefore only reconstructions can be seen. Having said this, the Roman Fort in Saalburg really gives you a concrete idea of the importance attached to control the borders of the Roman Empire. There are several informative posters in German and English as well as several artefacts excavated from this site. The price is reasonable and parking is free. Hopefully I'll have the opportunity to visit Hadrian's Wall in the near future but I'm glad I visited the German sites first. I visited the Roman Museum in Aalen which is east of Stuttgart along B29 road. It is a museum built at the site of a roman cavalry fort along the Limes. Actual ruins of the fort outside. Several other places along the Limes i identified and preserved or rebuilt. There is also a Trail along at least parts of the Limes in Germany, look for "Limeswanderweg" in your search programme. As Limes mainly was built of wood, it is not likely much could survive up to now. 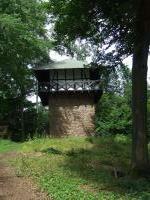 They have rebuilt tower for guardians some 10 km east of Aalen and in the same areas are some other sites to look at. I had previously resisted the temptation to tick off this site by visiting the remnants of Hadrian’s Wall in suburban Tyneside, so to do the site some justice I decided to walk a craggy 20km stretch of the wall between Once Brewed and Chollerford on an overcast Saturday in June. This was an exceptionally rewarding walk taking in the wall at its scenic best. The first section from Once Brewed until Housesteads was particularly impressive, especially the dip down to Sycamore Gap. It was a fairly strenuous trek, but the wall was continuously visible on this stretch and viewing it meandering up and down the hills was really rewarding. It was surprising just how much archaeology there is at this site. We had a look at ruins at Houseteads and Chesters, both of which were large sets of ruins and would be worthy of inscription by themselves, however there were turrets, milecastles and remains of temples popping up consistently along the 20km we walked. It must be a real delight for archaeologist to know just how much information they can gain from these sites. Like many others here we used the AD 122 bus which was a very useful way of getting to the start of our walk, and I imagine would be exceptionally useful if wanting explore the sites along the wall without your own transport. I runs from Newcastle which I think is one of England’s most interesting cities so gives you a chance to mix and urban stay with a bit of rural sight-seeing. I am pretty sure I will return to Hadrian’s wall at some stage in the future, and I would also be keen to visit the sites in Scotland and Germany to see the other incarnations of the roman frontier. The walk along the middle section of the wall was a really great way to get some exercise and also visit one of Britain’s best historic sights. Having now visited the boundaries of the Roman Empire in Britain and Germany I must say that the British wall is much more visible, and accessible thanks to the AD122 bus. Saalburg is indeed an interesting reconstructed fort in a pleasant forest location on a hilltop. I reached it by bus from Bad Homburg. From the fort I walked downhill through the forest passing several marked watchtower foundations along the way, to reach Saalburg station. Near Neuwied on the Rhine I found some excavations of Roman Baths in Niederbieber, and a reconstructed watchtower on a hilltop in Oberbieber. Both were reached by bus # 101 from Neuwied. In Miltenberg on the Main river there is an interesting museum displaying a number of Roman artifacts found along the Limes in that area. In Aschaffenburg I visited the Pompejanum, a reconstructed Roman villa. Near Konigstein in the Taunus I visited Kleine Feldberg, an excavated fort and bathhouse up a track from the Rote Kreutz bus stop at Glasshutten. There are many other locations worth investigating listed on the Limesstrasse website, but they recommend travelling by bicycle if you want to travel the whole distance. As a proud Northumbrian I have a keen interest in what happens to Hadrian's Wall. This summer I have been looking at it in depth for part of my University work. Visiting Vindolanda for the first time in about ten years, as well as Housesteads for the first time ever, has been very enjoyable - despite the dismal weather during my visit to the former. For anyone who does not have the benefit of a car to get around, using the AD122 bus is a must. Also, this summer I took a trip to Germany to visit Saalburg for myself. It is genuinely a fascinating place. In terms of value for money it was excellent. The bus fare from Bad Homburg station, as well as the entry fee, were both very reasonable. 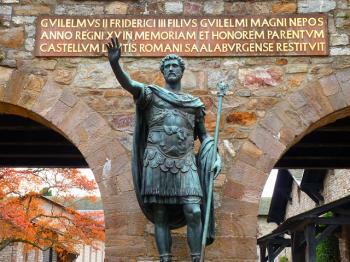 For any aficianados of Roman history, visiting Hadrian's Wall and Saalburg are a must! In our trip to Germany we have visited the Roman fort of Saalburg, part of the 220 kilometres Limes barrier Raeatian section, one of the walls that have been marking the boundaries of the Roman empire for some centuries. The original fort (90 AD) covered an area of about 0,70 hectares and had a rectangular plan with corner towers. In 135 AD was built a larger fort, of 3,2 hectares (221 by 147 metres), over the earlier one, with four gates, a stone and timber defence wall with rampart walk and a double ditch. The remains of many internal buildings have been excavated and entirely reconstructed in stone and timber under the emperor William II. There are the granary, the commander’s quarters, the barrack blocks for the common soldiers and the headquarters buildings with the monumental assembly room the colonnaded courtyard, the rooms, the offices and the armouries. Interesting are the reconstructions of a barrack room, home to a squad of eight soldiers who lived in close quarters, of the richly decorated officer’s dining room, of the regimental shrine, the spiritual and religious centre of the fort, of the ovens and of the “restaurant”. Between the remains of the civilian settlement just outside the fort there is a bath house, a guest house, the cellars and the wells of the private houses and the reconstructions of the Jupiter column and of the Temple of Mithras. Near the fort there is a reconstruction of the limes at an ancient border crossing and a long elevation of the soil where it passed. I quite liked the fort because it’s an impressive example of a Roman border fort, even if we have visited the remains outside the fort quite in a hurry, because they are in a wood and it was raining. The fort is worth of visit if you are in Hesse and I think that the Limes absolutely justifies the inscription, but in my opinion with the Limes in Germany and the Hadrian’s Wall in UK can be inscribed the whole boundaries of the Roman Empire in many countries. The state of conservation of the building is sometimes very good (the reconstructions), and sometimes they are ruined, but I think that the reconstruction of the fort, even if it has a historical value because it is of the 19th century, was a completely wrong decision that compromises completely its authenticity and the only authentic buildings are those ruined outside the fort. It is easy to reach Saalburg: you have to exit from the highway A5 going from Darmstadt to Bad Hersfeld at Bad Homburg and then take the road B456; you have to pay to visit the fort, but not the remains around it (if you want to see them well, walk on the Saalburg Circuit Road, 2,4 kilometres long, that brings you to the Limes and to the other remains). After a long period of aggressive expansion, the time had to come for one Roman emperor to put a stop to it and say out loud that Rome was not actually destined to rule the entire world and that the Empire had to have stable borders. This man was Hadrian, and to secure the borders of the Province of Britannia, he had this magnificent wall built between the coasts of the North and Irish Seas to separate, as the famous statement goes, "the Romans from the Barbarians". (Later, though, the borders were pushed even further north, when the Romans built the Antonine Wall in today's Glasgow-Edinburgh area and the south of Scotland was also part of the Empire). Breathtaking views make a hike along the wall a wonderful experience (and you can see the oaktree featured in "Robin Hood, Prince of Thieves"...) that nourishes your body as well as your mind. Roman history and their way of thinking rarely can be appreciated so closely. It is surprisingly easy to visit the Wall, at least coming (as I did) from Newcastle, where the AD122 bus waits for you. The sites of Vindolanda, Housesteads, and Chesters are especially interesting and give a great overview of the area's history and archaeology, especially about the Romans' daily life. Many letters from the soldiers posted here have survived, and some are quite funny, such as the auxiliary troops from Spain and Syria complaining about the miserable weather. I went there on a glorious (but probably rare) summer day, but I think the area is interesting even in winter. One of the best sights I have seen in all Britain. On a separate trip to Germany, I visited the Saalburg, a reconstructed border castle near Bad Homburg. It was actually built around 1900 on the orders of Kaiser Wilhelm, and provides interesting insights into Roman life on the frontier. Some original features are still preserved, both inside and outside the castle, as well as some actual remains of the Limes itself, about a 10-minute walk away from the castle through the forest (complete with "You are now leaving the Roman Empire" signs). On yet another trip, I went to see the Antonine Wall. From Falkirk station (on the line between Glasgow and Edinburgh), I took a taxi to the site of Rough Castle and took a walk around - there is really not much left to see, basically only trenches and other changes in the landscape, no built structures. There are some helpful signs, but you need a bit of imagination here. 3.5: Ian Cade Martina Ruckova Jay T Allan Berry Antonio J.
Frontiers of the Roman Empire: Hadrian's Wall and vallum between Baron's Dike and Birky Lane at Walby, in wall miles 60, 61 and 62. Canals: Antonine Wall: when a new section of the Union Canal was built in 2000 a Tunnel was built under the wall to avoid damaging it. Discovered from the Air: The Nomination File for the "Antonine Wall" contains numerous references (search on "Aerial") e,g "All the 20 camps along the Antonine Wall have been found through aerial survey and photography. None is visible today." and "Aerial survey and photography shortly after the Second World War led to the discovery of a new type of structure on the Wall: the fortlet." Golf Courses: Hadrians Wall runs thorugh Haltwhistle Golf Course. The Antonine Wall runs through the Golf Course Douglas Park.